My kids are mostly 9 years old, although a few are 8. I think if you read this aloud to her, at least to get it going, you would both have a good time. 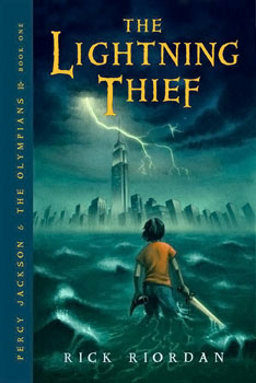 Loved this post and reading your students thoughts on The Lightning Thief – I've had this book for ages, but have to pick it up. After reading your post I think I'll give it a go – gotta love a book that brings mythology into the mix! Wonderful post, Bellezza! It was wonderful to know about your students' reactions to 'The Lightning Thief'. I read it a few years back and loved it! I remember liking Ares very much – I thought he was cool 🙂 I loved reading the reactions of your students and what they thought about the book. The comments from your class are adorable! And it's great that so many of them are planning on reading more this summer. I've not read the series myself, but it sounds like one I would have loved had it been around when I was in elementary school. There's a dissenter in every bunch! My son listened to this when he was in college and loved it. I just finished this last week. My kids read it last year (13 and 11). It was cute, and I liked your students reviews. I certainly learned more about Greek mythology from that story than I've ever learned before.thanks for the quiz – I love trivia. My class of 8 year olds are currently loving 'A Series of Unfortunate Events'. I am impressed with the reviews they have written, theu sound very self-assured in them. Well since I am a "kid at heart" I already have this one on my list. I love the student reviews that you shared. I especially loved the one who said they loved the book better than the movie! Kay, it is an excellent way for them to be introduced to mythology, isn't it? Every chapter we read had us looking up something on Google, from the Helm of Darkness to asphodel…you name it, the kids were curious and wanted to know more.Audrey, they'll probably put me out of a 'job'! Kids' perspectives are so fresh and unique, and they're really worried about what other's think. Which isn't always a good thing, of course. :)Nadia, if you pick it up it shouldn't take long to complete. And, if you love it, there are about four more in this particular series! Vishy, it's funny that you mentioned Ares because he was my favorite 'recreated' mythological character. I loved him on his motorcylce, with black leather trench coat, and firey eyes. Ooh la la!Simplerpasttimes, kids love fantasy in general, and this was a perfect thing to get away from dragons and magic spells (if you know what I mean).Bermudaonion, the dissenters keep us on our toes, do they not? Raidergirl3, how fun that your children read this. My son came into school one day and he read a chapter out loud. I thought he'd really like it, but he's twenty and it proved to adolescent for him. When we're thirty+ we can appreciate those days gone by with greater relish.Tiny Library, I didn't know you had a class of 8 years olds, too! I've tried reading aloud from The Series of Unfortuante Events, but the uncle who was planning on killing his neice was a bit much for me. I know the kids love those stories, though, and they seem able to keep everything in better perspective than I.Kathleen, aren't we so often disappointed in the film of a novel? Many of them who had seen the film said, "That's not how the book goes!" and I had to remind them that the book came first; the book was the author's original intention. They seem to forget that when they aren't immersed in literature.